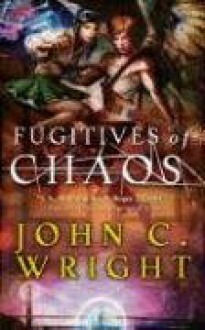 John C. Wright established himself at the forefront of contemporary fantasy with Orphans of Chaos, which launched a new epic adventure.Wright's new fantasy, continuing in Fugitives of Chaos, is about five orphans raised in a strict British boarding school who begin to discover that they may not be human beings. The students at the school do not age, while the world around them does. The orphans have been kidnapped from their true parents, robbed of their powers, and raised in ignorance by super-beings: pagan gods, fairy-queens, Cyclopes, sea-monsters, witches, or things even stranger. Amelia is apparently a fourth-dimensional being; Victor is a synthetic man who can control the molecular arrangement of matter around him; Vanity can find secret passageways through solid walls; Colin is psychic; Quentin is a warlock. Each power comes from a different paradigm or view of the inexplicable universe, and they should not be able to co-exist under the same laws of nature. They must learn to control their strange abilities in order to escape their captors. Something very important must be at stake in their imprisonment.